This set contains 6 popular lustre colours in a 60ml bottles. 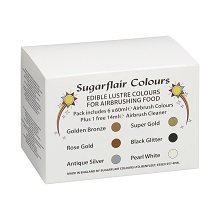 These colours are high-concentrated colours, use to create a bright sparkle finish to your creations. This pack includes a free 14ml cleaner to flush the airbrush gun after use.